Amid the excitement surrounding the Obama Administration’s use of the internet for massive public engagement, I’ve been looking for web-based applications that can be used on a much smaller scale to support collaborative policy projects. While online services can’t yet take the place of in-person dialogue, there are many applications that can offer significant support through real-time web meetings. This post gives a quick overview of one of the key meeting technologies: web conferencing. This provides the core functionality of today’s online collaborative experience. While the basic technology has been in use for some time, it’s only in the last few years that it has become affordable to smaller organizations. No longer restricted to in-house networks of large agencies, online meetings are accessible from any computer by means of a single link in an email or instant message. Web conferencing is an online meeting service that enables all participants to see the computer screen of the session convener while communicating by voice. Live presentations can be conducted using any application, such as PowerPoint, a spreadsheet or animated video – whatever the host of the meeting is displaying on screen. A whiteboard, available in most of these applications, permits drawing, as on a flip chart, during the session. The host can shift control to another attendee’s computer at any time, allowing for collaborative work on the whiteboard or any other application. Many of these applications now include limited video that shows one or two participants in corner windows, leaving the main part of the screen visible for the continuing demonstration. Other features include the ability for participants to communicate privately by means of text chat in side conversations during a meeting. Audio is provided either through a conventional phone conference call or through a voice-over-internet (VOIP) service using the computer’s built-in speakers and microphone. These days, most of the applications incorporate voice communication into their pricing package rather than require purchase of a separate service. Below I’ve included a video demonstration of DimDim, one of the newer applications. I apologize for the fact that this is a promotional piece (I have absolutely no connection to the company! ), but it is the clearest presentation I could find. It summarizes features that are common to most of these applications. GoToMeeting charges a flat monthly fee for unlimited users with up to 15 participants. Although it is one of the more established screen-sharing meeting applications, it lacks features that have become standard for most competitors. These include whiteboards with drawing tools, file transfer and video. DimDim offers a limited video feature, as shown in the demo, permitting meeting attendees to see the person in charge of the screen. Its free version permits meetings with up to 20 participants. Yugma features a Skype edition and teleconferencing for larger meetings. The free version allows meetings with up to 20 participants, and the Pro version allows recording of every meeting for later playback. 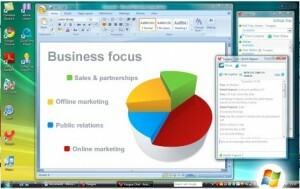 Microsoft Office Live Meeting Live Meeting is a hosted service accessible through Microsoft’s Office applications. All Office features are available to use during screen-sharing sessions. Meetings can be scheduled and announced through Outlook in Windows, and audio is provided either through the computer on a VOIP service or by conventional call-in. Limited video elements are also incorporated. Vyew includes a built-in VOIP service for up to 50 users and free tele-conferencing for larger meetings up to 150. It has an extensive set of drawing and annotation tools as well as optional plug-ins for specialized needs. Each meeting space is known as a VyewBook and contains “pages” which can be used to assemble, edit and comment on content from many different applications. The free version allows up to 10 participants. Yuuguu has its own VOIP capability but also integrates with Skype. Screen sharing is quite fast to initiate through instant messaging or chat (all major instant messaging services are supported). Screen control can also be shifted quickly and files exchanged through the chat medium. The free version allows meetings with up to 5 participants. WebEx is the most senior provider of screen-sharing technology. Although well known for a focus on corporate services, it also provides a package for small-to-medium organizations that permits meetings with up to 25 participants for a flat monthly fee. In future posts, I’ll be reviewing the state of video conferencing as well as the use of older technologies specifically adapted to policy dialogue and deliberation. You’ve got a great list of products here, but you might want to add RHUB (www.rhubcom.com) to your list, which is what we’ve got going at my work. It’s a 4-in-1 application, which is pretty useful for when I need to put together a presentation for overseas employees. Thanks for this reference. I had not heard of RHub previously, and it looks like an excellent service. Its tie-in with Huddle is especially interesting since that’s a platform I’ve been trying out. Thanks for adding this resource.